My brides and grooms frequently ask me for recommendations on other vendors – who makes the best cakes, best deal for flowers, and even other photographers if I’m booked for their wedding date. Friends, if you’ve been looking for a great wedding website, one place for both you and your guests to communicate information easily, I can’t wait to share with you this amazing, FREE service from Basic Invite! 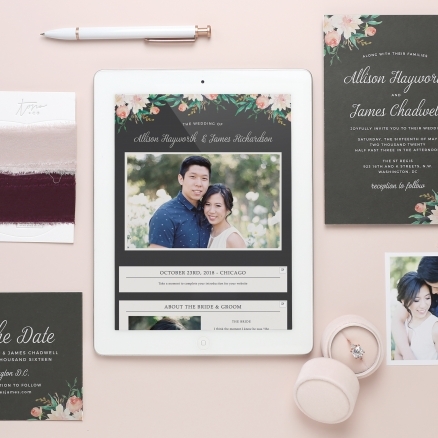 Basic Invite has recently announced they now offer completely customizable, wedding websites for FREE and I’m over the moon excited about it! The styles of the websites vary from trendy to classic, traditional to fun and flirty, rustic to vintage – in short, something to reflect everyone’s personality. You have the flexibility to change colors (180 custom colors to choose from) and add your own text and photos because come on, you know everyone wants to see those engagement photos! However, this personalized website goes way above and beyond that. You can have your guests RSVP online and manage those responses (who’s getting the prime rib? How many vegetarian plates? It’s easy to give your caterer the info!) You can post maps and location information making it one bookmark away for your guests to easily find the ceremony and reception locations (no more losing Uncle Bob between events!). You can also link to your registries (woot!) and collect addresses for thank you notes, easily making this a one stop spot for both you AND all your guests! While you’re at it, incorporate your custom design to make beautiful and professionally printed invitations, RSVP cards (for grandma and those who would prefer a more traditional, mailed version), event programs, and thank you notes after the wedding. Ask them about custom samples too – you can order a printed sample of your invitation and see exactly how it will print before placing your final order. With Basic Invite, completing your entire invitation suite is simple and easy!. Their website offers a demo for each of their designs so you can get a better idea of what it will look like (here’s my favorite — Delicate Daisies). I would LOVE to see your website design after it’s finished (and send in my RSVP :D) so send me a link if you try Basic Invite out!